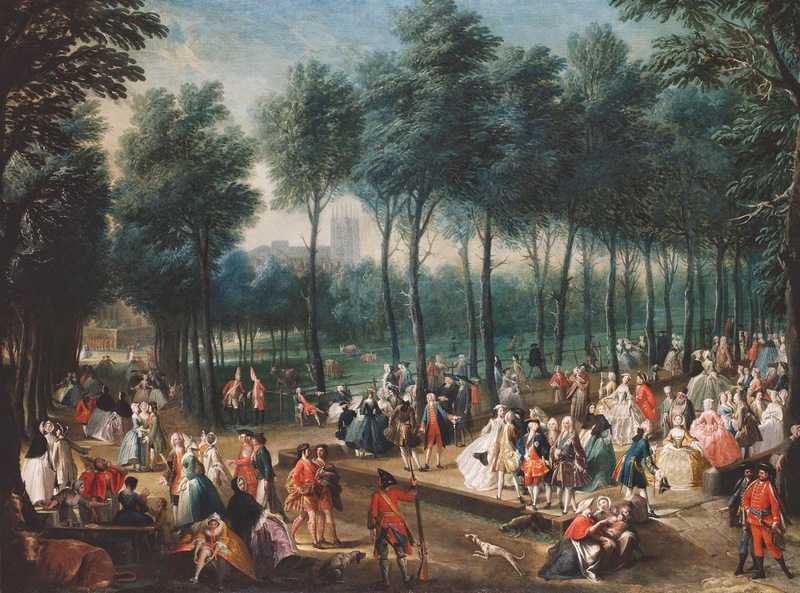 This is one of my favorite paintings of 18th c. London: St. James's Park and the Mall, attributed to Joseph Nickolls (active 1726-55). One picture truly can be worth a thousand words when it's as packed with this much detail and vitality. 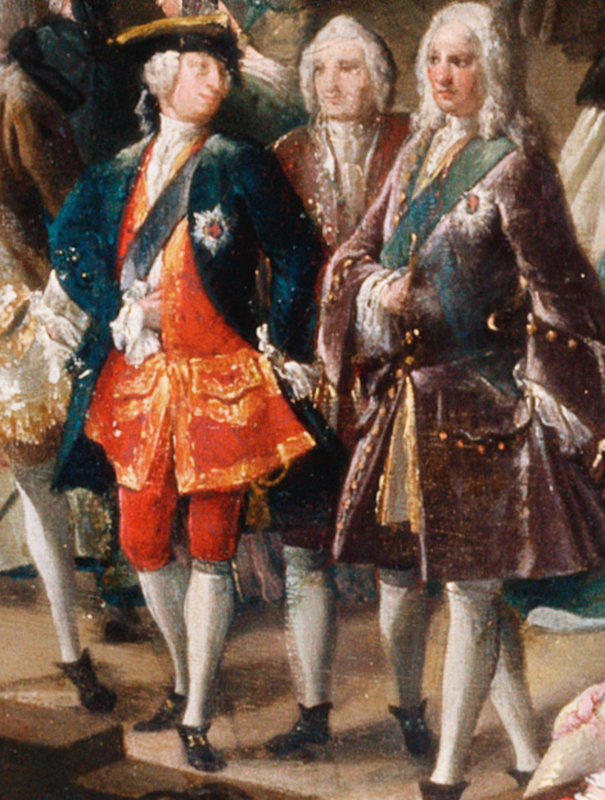 The centerpiece of this painting is Frederick, Prince of Wales, detail above, strolling through the Park with his noble entourage. He's easy to spot: he's front and center, dressed in a red, gold-trimmed waistcoat and breeches with his Garter Star on the front of his blue coat. To the left is the park's milk-bar, complete with cows, and a fixture for park-goers looking for healthy refreshment. The London landmarks of Whitehall Palace and Westminster Abbey are visible in the background. But it's all the other people around the prince that make the picture so much fun to study. 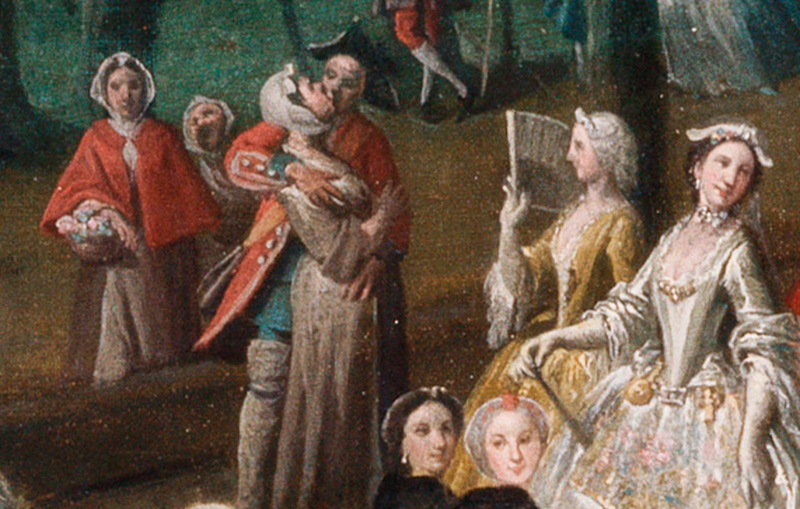 There are soldiers from three different regiments and sailors on shore-leave, an amorous couple drawing disapproving glances, detail right, a woman tying her stocking, detail lower left, another lady whose hoops have flipped up as she sat, and a man relieving himself over a fence. Intriguingly, there's a well-dressed woman of color in one of the groups. This painting is a bit like a Georgian "Where's Waldo? ": the more you study it, the more you discover. Since Blogger will enlarge an image just so far, here's a link to a much, much larger version so you can explore the details for yourself. 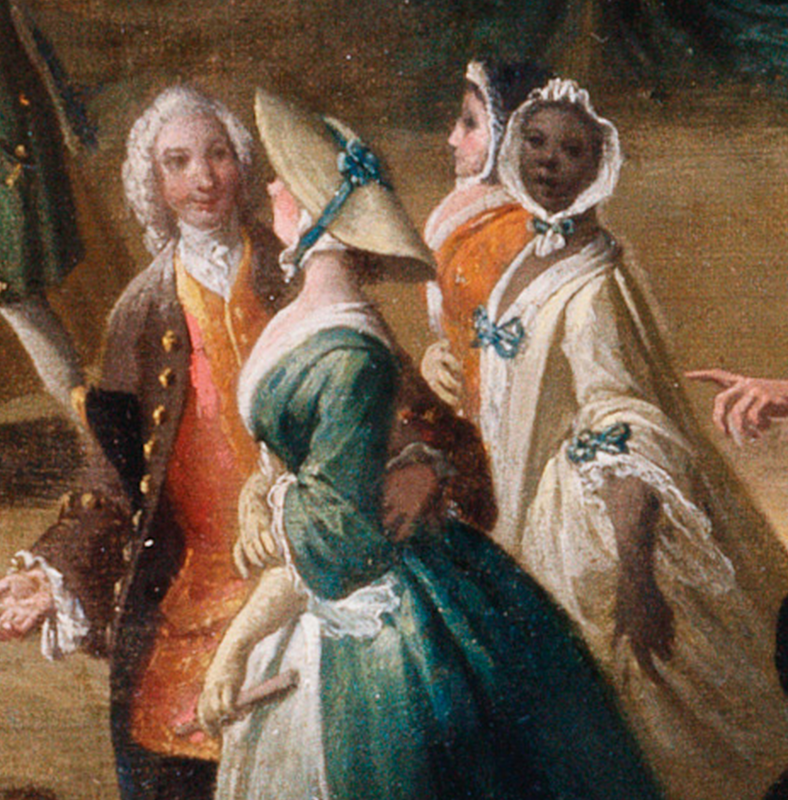 The painting now belongs to Her Majesty Queen Elizabeth II, and its web page goes into considerable (and for us Nerdy History Folks, quite fascinating) detail about the history of the Park as well as more information about the people shown. Thank you for posting this! I'd seen it before but had never taken the time to look at it closely, and the link you gave was excellent for a detailed examination. It gives an impression that London that day was quite cosmopolitan! The Royal website explains the significance of the tartan-wearing soldiers; I was struck by how short their kilts were (well above their knees). They must have been so chilly to wear, especially in Scotland. I'm a bit surprised that the artist is unknown. P.S. The last sentence of my previous comment was because the Royal website merely says "Attributed to British School, 18th century". I see now that you give an attribution to Joseph Nickolls. Helena, if you click on the "further details" tab on the Royal Collection site, they mention Nickolls as the current attribution. It also says previous attributions included William Hogarth (no way) and Samuel Wale. You'd think that since the painting was acquired by George IV for the collection that there'd be some definite record of the painter - but apparently not. Perhaps some day some lucky art historian will find a letter or bill that will give the definitive answer, but until then, it seems the attribution must be a moving target. I am interested that several of the women's gowns have skirts that are very short on the side. See the woman in blue directly left go the prince. She is wearing side hoops/panniers, and her skirts rise up on the sides over the panniers. It is as though the gown was cut to wear with a round hoop or no hoop at all, but the lady decided to wear it with side hoops. There are several in the picture like this. 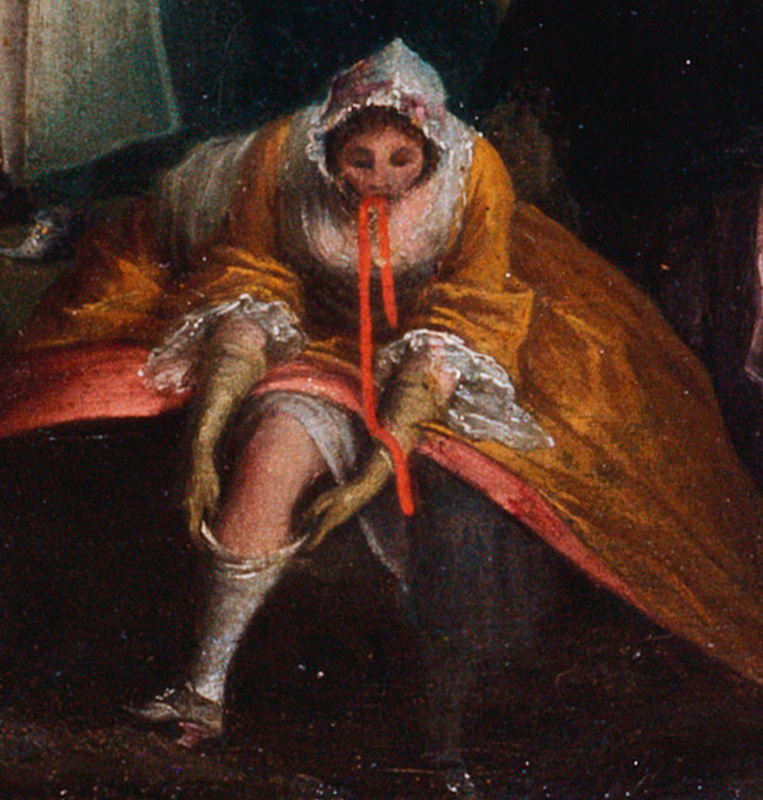 The seated lady in white behind her is wearing a round hoop-a style popular in the 1730s but going out of style by the 40s. I wonder if we are seeing the transition from the round silhouette to the side silhouette. These ladies have adopted the new fashion, but are wearing them with their older gowns not cut for the new fashion. 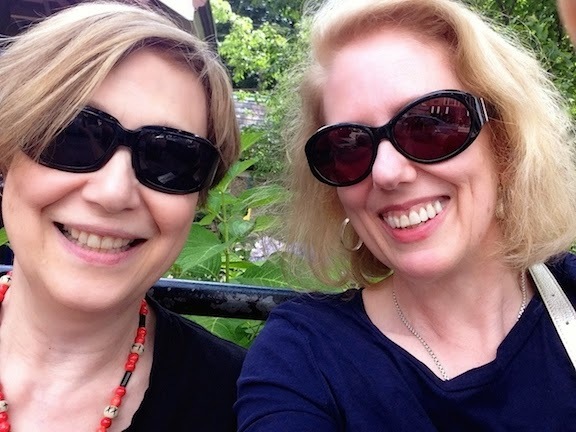 Very practical ladies, I'd say!